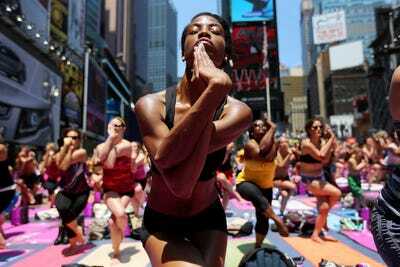 Yoga has so many passionate devotees, and so many different types (Hatha? Bikram? Vinyasa? ), that it can seem intimidating to true beginners. But if you’ve ever walked by a yoga class and decided that dark magic ruled all that happened there, do not fear: Yoga is actually harmless. Not only that, it can be really good for you. And it’s actually quite easy to get started. I’m not talking about the crazy advanced poses where by some stroke of luck — or a spell — the teacher hovers on one limb while the rest of her body curves lithely into some seemingly impossible shape. No, the yoga I’m advocating is the kind practically anyone can do, provided they know a few basics. Ready to clear your mind and get your heart pumping? Read on. I currently practice yoga about six days a week and I do a mix of everything from 'open' to 'power' classes. When I started, I only practiced about once a week -- if that -- and I steered clear of anything with the words 'advanced' or 'power' anywhere near the title. I love yoga because it quiets my mind, makes me feel strong, and challenges me to do things I'd never thought physically possible. 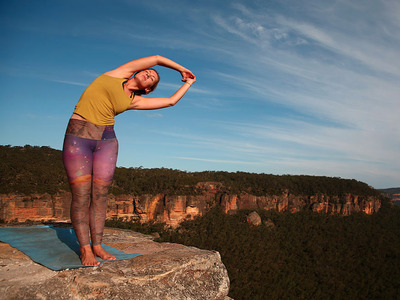 The science backs me up here: Dozens of studies have linked a regular yoga practice to stronger, more flexible muscles, a healthier heart and, in people with depression and anxiety, a decrease in negative symptoms. To start, I'd recommend looking for classes with the words 'vinyasa' or 'flow' in the name -- if you want a workout, that is. If you're more interested in learning the standard poses, Hatha or Bikram (a type of yoga which involves heating the studio to the point where you sweat so much, towels are required to participate) will suffice. 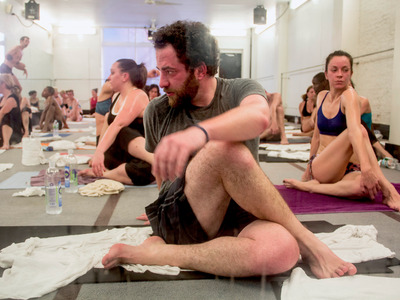 A man sweating it out at a Bikram class in Boston. 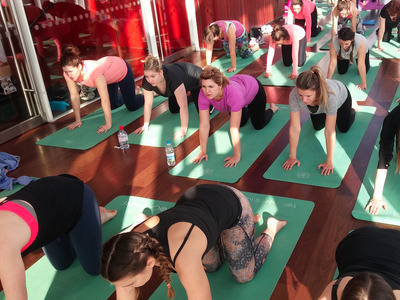 If you're going for the vinyasa or flow classes that will get your heart pounding a bit, an 'open level' class is a good bet. That way you can occasionally catch a glimpse of someone doing a more advanced version of the pose you're doing. This can give you idea of what you can potentially work up to. Many vinyasa classes are technically open level, meaning that anyone from a beginner to an advanced practitioner can participate and benefit. Most vinyasa teachers structure their classes in a way that lets them take students through a basic level of flow from which more advanced practitioners will build. 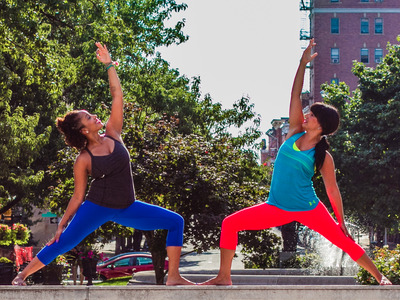 One of the most important parts of any yoga class is the teacher. He or she will set the pace, encourage and challenge you, and help show you the proper alignment (set-up) for each pose. Teachers will often do hands-on assists, which involves physically moving your body toward the right alignment. This is important to help avoid injuries. Most yoga poses feel incredibly awkward and sometimes just plain wrong when you're first getting into them; that's totally normal, but you should never be in pain. If anyone in your class looks like they're 'naturally good,' don't be intimidated; they have likely just been practicing for a really long time. If you're in doubt about how to do a pose, go slow. Often times, moving more slowly is actually more challenging and less likely to get you injured, so it's generally a good way to go. Keep in mind, whichever class you try, it will take a couple of times for you to find your groove. You'll never 'waste' a class -- learning what you dislike can be just as valuable as finding out what you love. If after a few sessions you decide you hate it, that's fine. You might change your mind and start back up again later. I actually didn't get super into yoga until about six months after I'd broken both of my wrists.